Created for use on 4K displays (up to 4096 x 2560 pixels). Improved support for Windows Regional Settings. 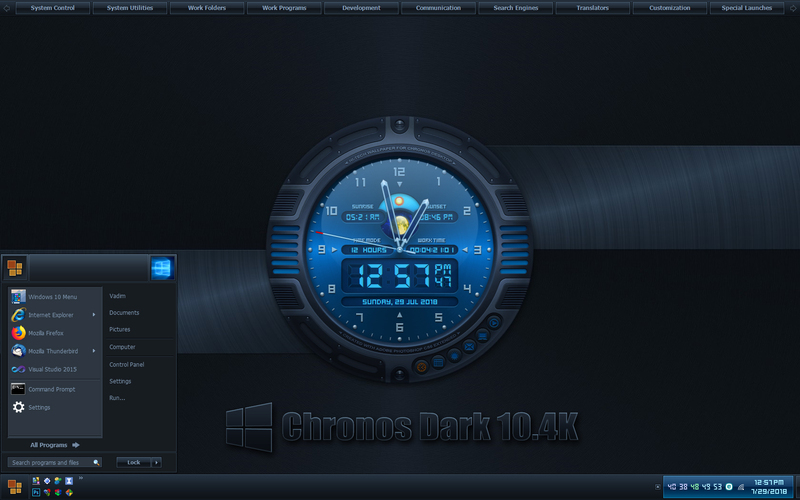 Chronos Dark is a desktop application that may be classified like Interactive Animated Wallpaper. 6. Media Player (with Audio Spectrum Analyzer and Graphic Equalizer). 1. Extract Chronos Setup.exe from the zip file and run it. The necessary Chronos Wallpaper will be installed and applyed automatically (for any screens up to 4096 x 2560 pixels). 2. Configure Clock / Weather Informer / E-Mail Checker and enjoy. *A detailed Help File can be found in the Chronos Desktop installation directory. * To uninstall the program you may click Uninstall shortcut (located in the installation directory) or use Add Remove Programs from Control Panel. But the best and clear way to do this is run Chronos Setup.exe once again. Any temporary files and folders as well as registry keys and values will be totally removed in this case. Sweet!!! Now the theme is even better!!! Thank you. I'm running Win 7 Pro Version 6.1 (Build 7601: Service Pack 1) and cannot get Chronos to load. Any recomendations? I lowered the User Accoount Control Settings to Never... still nothing. Uninstalled and re-iinstalled.....nothing. I appreciate your work and would appreciate any help you can give.